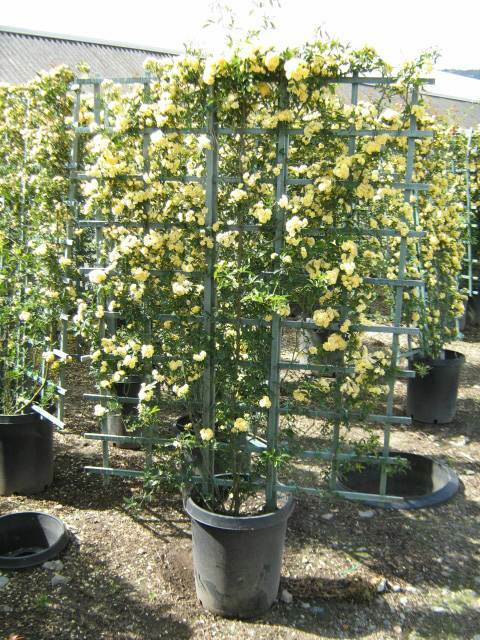 Banksia rose is a vigorous and easy-to-grow climbing rose that produces masses of small double yellow flowers. While there are other varieties of banksia rose, ‘Lutea’ tends to be the most floriferous. Perfect for climbing over a feature arbor, trellis or fence, plants can quickly grow to 20-feet tall and become the crown jewel of any landscape. Be sure that the structure you provide is sturdy, as mature banksia roses are quite heavy. You can also let banksia rose spread across the ground as a large rambling shrub or allow to spill over a retaining wall. While flowers offer a slight fragrance, it is often negligible. Minor thorns are present, however some stems may seem almost thornless. Foliage is shiny and bright green. Plants prefer a slightly-acidic well-draining soil, however they can adapt to soils with more clay. Plants prefer consistent moisture, as most roses do. ‘Lutea’ will tolerate a bit of afternoon shade, however plants will be more vigorous and disease-free in a full sun location. Other than the removal of dead branches, or removal of canes that have outgrown their space, pruning should be limited.